We went to see the Lemonheads perform their 1992 blockbuster album It's a Shame About Ray last Tuesday at The Paradise. 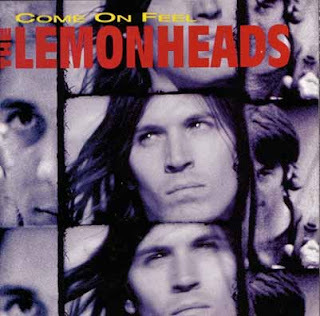 I've been aware of the Lemonheads at least vaguely since the '80's. Evan Dando was a couple years older than me and went to Commenwealth high school with the older siblings of some of my friends. In 1989 I was stranded in London and staying with one of those older siblings and we saw Lemonheads stickers all over a neon filled night club that served guarana. She said, "I think that's the guys who went to my school!" I thought it was a coincidence. those losers from the brainiac high school? I don't think so! What would they be doing in London? but I was totally wrong. It was indeed those Lemonheads. I heard a few years back that he had gotten cleaned up and off of some drugs. But he sure didn't look it with his greasy hair and skinny frame. But he sang his heart out over his buzzing guitar and we danced and danced. I forgot my f&^%cking ear plugs again, so my poor ears rang and rang for the next two days. Going out on a Tuesday night is pretty brutal these days. I knew I'd be exhausted there. I ended up leaving Rich to watch the encore by himself because I wanted to be home to relieve the friend who was babysitting for us. He ended up jogging home from the Paradise in a thunderstorm. He came home wet but elated and very, very surprised that his shoes hadn't fallen apart on the way. Not bad for a old lady evening.